It's in the warm, sticky, sweaty creases of my baby's neck. The folds of skin that, with no place else to go, spill over onto each other, smelling sweetly of soured milk and a few too many kisses. It's in the curl of my toddler's white blonde hair. That no matter how many times I try to brush them down they spring to life, each beautiful curl with a mind of it's own. A perfect representation of my one-of-a-kind little boy. It's in the soft whir of the infant swing. A place where, when I need rest, I know he is safe from the inquisitive hands of his older brother who, sometimes, loves his brother just a little bit too much. It's in the tinny, bubbly giggle of my first-born's laugh. The kind of laugh that makes his eyes go wrinkly at the corners. The kind of laugh where he smiles so wide you can see every last tooth. It's in the delicious smell of freshly laundered baby clothes, hung neatly in the nursery. Tiny pairs of character-laden T-shirts folded pristinely into closet drawers. Drawers that once held receiving blankets and newborn hats, now bearing storybooks and Matchbox cards. It's in the warmth of two tiny bodies, nestled together in your bed before 8am. Lazily taking in the morning sunlight, listlessly rubbing sleepyheads from their eyes, full diapers causing their jammie pants to sag in all the wrong places. It's in the crunched up, crushed up goldfish that adorn my carpet. That no matter how many times I vacuum them up, I still manage to find those delicious flecks of gold scattered about my house. It's in the wet open-mouthed kisses that I'll all but one day too soon miss. The hugs of tiny little arms that wrap themselves all the way around your neck. It's in the wince of stepping on a Lego Duplo block in the middle of the night and wanting to curse out loud so terribly at the pain shooting up your leg. It's in the incessant "mama's" and "why's." It's in those every day teachable moments. It's in the kind of love that envelops you and squeezes you so tight that it catches your breath and takes it away. It's Motherhood. It's all in the details. You are the BEST mom. Those boys are so lucky to have you. You've got me all emotional with this 31 days of yours....goodness. Love you, AP. I love this post! Made me feel all warm and fuzzy inside, especially when dealing with a lack of sleep, a 21 month old, and being 36 weeks pregnant with tiny elbows and knees poking painfully out of my belly. Thank you for this! Puts everything back in perspective. You are so right with this post. It's the little details that make the biggest impression on us. I smiled the entire time reading this. So true! Without all those little details that we want to cherish forever, motherhood wouldn't be as exciting, as heart-overflowing. I love how you described the too-full morning diapers and sagging jammies - I just want to snuggle in the morning but most days the diaper change has to happen first. 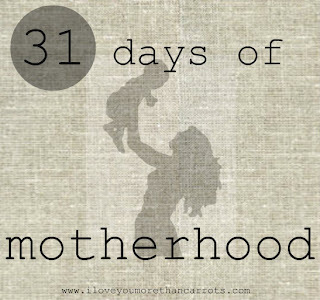 Love this and really enjoying your 31 days! I agree this post is so touching! Being a first time mommy - sometimes I think I overlook the little moments. I will be sure to cherish EVERY moment now - I am one to give little bitty head and those cheeks of my girl probably TOO many kisses but it is irristable :) And one day she isnt going to let me nibble on her. Your boys are beyond lucky to be able to call your their mommy! Coming out of my lurking closet to just say this was beautiful. As a long time follower (first time commenter! ), I absolutely love everything you post, but this just struck a chord with me - after a tough morning with a very independent almost-two-year-old, I truly needed this reminder today. Thank you! You're an amazing writer and mother! You are just the best. I'm loving these posts so much!!! And those boys of yours are the luckiest. Very sweet! And true. My oldest son is 12 today. TWELVE! Where did the time go? I love that you mentioned the "whys". Colton's new favorite thing to say is "what's that place about?" as we are driving in the car. You are killin' it with these posts! Love this post! You are inspiring me to write more about the details..to remember and never forget things like (in my case) crushed cheerios on the floor! Well make me tear up why don't you! Love this. quit making me cry! Eloquent. Those boys are so lucky to have you! !